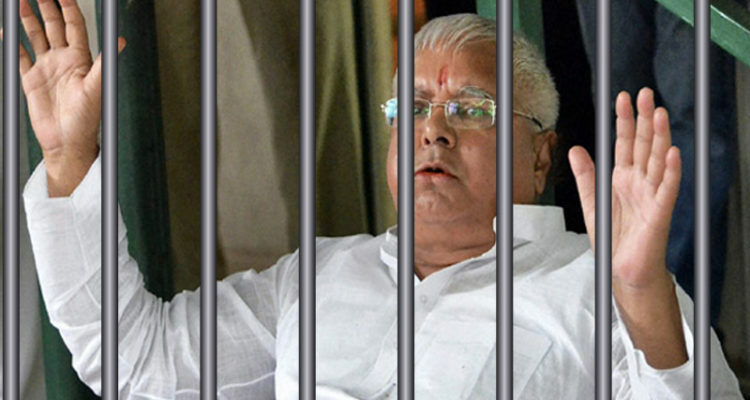 The Special CBI court sentenced the 69 year old former Bihar CM and the current RJD Chief Lalu Prasad Yadav, fourteen years of imprisonment on Saturday with regard to fourth fodder scam. This scam was related to fraudulent withdrawal of Rs. 3.13 crores from Dumka treasury by Animal Husbandry Departments officials around 1991. The CBI on investigation found 250 witnesses during the trial to prove the charges against the accused persons. Yadav has been sentenced for seven years and fined Rs. 30 lacs under Section 120/420, 409, 467, 471 and 477A of the Indian Penal Code, 1860. In furtherance to that he has been given a jail time of seven years and fined Rs. 30 lacs under section 13(1)(C) and (D) of the Prevention of Corruption Act, 1988 and both of these sentences would be acted upon simultaneously. He would have to undergo an additional two years of jail term if he is unable to pay the fine. The above mentioned sentences were also pronounced for 18 other convicts in the case by the Special Judge for CBI Shivpal Singh. And it was ordered by the Judge for holding an inquiry to estimate (if any) disproportionate assets that have been acquired by the convicts after 1990. It was further stated that any such property about which the convicts are unable to explain, would be confiscated. Lalu’s son and former deputy chief minister of Bihar Tejashwi Yadav has alleged that there is a threat to his father’s life, blaming BJP for conspiring against Lalu Yadav. He also promised to challenge the order passed by the CBI court in the High Court. Due to the said conviction, Lalu would not be able to contest elections or hold any position in public offices. The author, Gatha Shivhare is pursuing B.A.,LL.B. (Hons.) (3rd year) from Maharashtra National Law University Mumbai.